They said it couldn't be done, they said it shouldn't be done, but we went ahead and did it anyway. Isn't that what all heroes do. 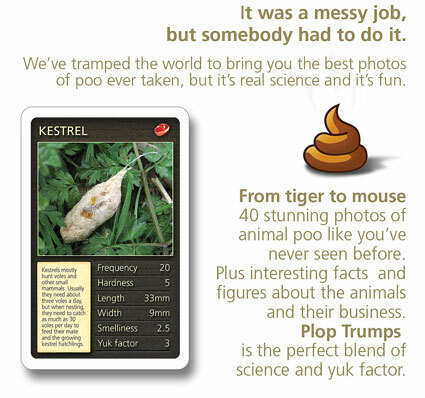 Brought to you from the whirrings of an 11 year old mind, it's not Top Trumps, it's Plop Trumps, buy them on dadcando, this is our first real you-got-to-buy-it product. Already reviewed as "the freshest thing to come out of the Top Trumps genre", and "the coolest kids thing in the history of the world ever..." we don't think there's anyone who doesn't secretly (or openly) find this fascinating. As well as some very scientific pictures specially taken for dadcando and some great vital statistics, each card has a very educational and interesting factoid on it. For example, did you know that a single locust can eat its own weight in food per day, and as the average swarm covers 100 square kilometres and is made up of tens of billions of locusts, together a swarm can eat 70,000 tonnes of food each day. You wouldn't want to see one of those coming if you were just about to harvest your crops! Enormous fun to play, huge kudos to own, get your here. 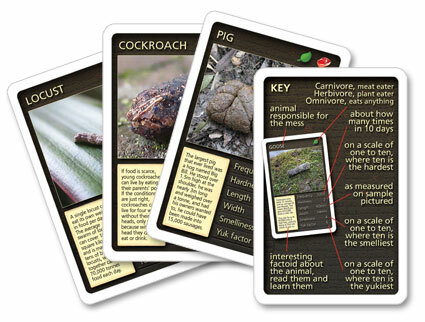 These aren't top trumps, they're Plop Trumps, the wickedly funny, hugely scientific, and the tiniest bit gross, new competitive card game, perfect for those of curious mind, of any age. Beautifully photographed, elegantly designed and wittily written, each Plop Trumps deck contains 40 fabulous cards, packed with fascinating pootastic trivia and the most compelling images. After all, who doesn't want to know what a cricket poo looks like? Or just how big and smelly a tiger poo really is? Or exactly how much atmosphere-busting-methane a cow actually produces each day? Well now these questions, and hundreds of others just like them, need never go unanswered again. Make your kid happy and oh so cool at school, buy a deck today, because Plop Trumps is the perfect gift, or be a meanie, and buy them to keep them for yourself. ...Plop Trumps have been carefully written to contain no offensive language and therefore are suitable for inquiring minds of any age (over three years). Same day dispatch We ship from the United Kingdom by first class post, and to the rest of the world by airmail. Where possible, orders received before 1pm are dispatched on the same day. Please allow Allow 3 - 5 working days for delivery within the UK, and 7 - 10 days for international European deliveries and 7 - 14 days for international, rest of the world deliveries. Got your Plop Trumps and you like them? We want to hear from you. Leave us a comment or some feed back. Plop Trumps received with no problems. Knowing the prospective recipients as I do, I know that they will be very well received!! I think they're a great idea! They arrived today - thanks for a brilliant idea and really quick delivery. I've just recieved my set of Plop Trumps (which are great by the way) but wanted to say what a fantastic service! Ordered on Saturday, received on Monday, best price available (inc. postage) what more could you ask for. Excellent. Thank you very much. I think my four nephews (aged 4 -9) are the one who are really going to love these – I might just be about to become the coolest Aunt – thanks! By the way I saw these in the Saturday Telegraph top 50 presents list. 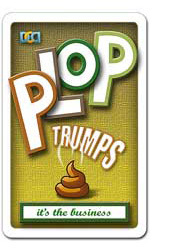 heh heh...Plop Trumps...brilliant! My godson will love them! Thanks for the quick dispatch, saw them advertised in the Saturday Telegraph by the way. Cheers, Jen. 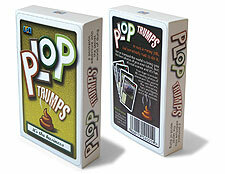 Many thanks Chris, the Plop Trumps arrived on Saturday! ; well impressed with the speed of dispatch! 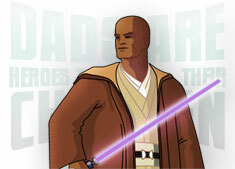 - though I'll need to wait until Christmas to see how good the game is. Many thanks. Just wanted to let you know that the boys (all 3) just love your plop trumps. We were going to save them for a Christmas gift, but couldn't wait to get them open and to play the game. They all love them. I find them just sitting reading through all the info - and then we get little chunks of info at later times .... like when we are in the middle of eating ...!! Well done on producing such a beautiful set of cards, such interesting facts, and making it all such fun. Great game thanks for the quick delivery, my grandson loves them, they are at the moment been played with by a coach load of kids on the way to Switzerland. Hi Chris, These cards are great!! saw them advertised in a copy of bizarre mag and thought I have to have a pack for my nipper! lightning speed next day delivery and easy to pay for on pal pal - couldn't ask for more! thank you. Hi Chris, I received the cards the very next day - thanks for the speedy service!I ordered 4 packs; one for myself, one for my partner's sister who is a conservationist, one for my 11 year old daughter and one for my friend who has an unsettling fascination with poo. They all LOVED the cards, and have been showing them to all their friends and colleagues, so they really have been a big hit all round. 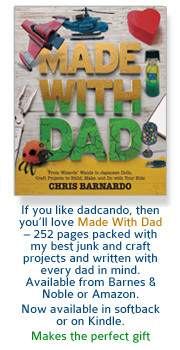 Well done for making such a fun product and for the whole Dad Can Do concept. I wish you every success with it all. Dear Chris, Just wanted to thank you for the fast delivery time - the cards arrived within a day! Also the present was greatly received and has given us a good few hours of laughs... very creative product! Thanks again. Hi Chris, Thank you! I saw your product article in the Metro and what made me smile more than anything was reading about someone who participates and gets involved. There are too many people having great ideas and doing nothing about it. I look forward to visiting your site regularly. PS My 30 year old boyfriend is going to love plop trumps... poo and animals two of his favourite subjects. I have to say it brightened my day up when I saw the article on the cards this morning. I'm not a single Dad so my wife will no doubt apply a woman's sense of humour to the cards... but all 3 of my kids, who are still in the "talking about poo is funny" stage, will think the game is just brilliant. Thanks Chris, for my daughters birthday, she will think they are great, much appreciate the effort. Hi Chris, I saw the article in the Metro and wanted to get some for my friend in Canada so I'm going to send them to him, he has an unnatural interest in poo so these are perfect! Your son was totally right, Plop Trumps are wicked! Many thanks for sending the cards out so quickly, received them today! Read the article in the Metro newspaper about them the other day and thought it was a brilliant idea! Sure my brother will have hours of fun with them! Hope sales go well and thanks again. 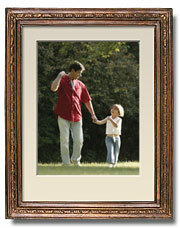 Dadcando would like to thank Paradise Wild Life Park, without whom this project would not have been possible.